An international art star, Keith Haring and his work have often been characterized as quintessentially of the eighties—an embodiment of the decade’s street art, hip hop, and urban energy in New York. While his career involved a diverse range of art making—painting, drawing, performance, video, murals, and art merchandising—his subway drawings stand among his most well-known and celebrated work. Haring drew over 5,000 chalk drawings over a five-year period, from 1980 to 1985, in New York City subway stations (visit the Keith Haring Foundation website to see his work year by year). Since the beginning of his career, Haring was determined to create art that could be for everyone, both through an accessible style and by locating his work in easily reachable, public locations. Creating art on the street meant that a bigger audience could see his work, outside of the more insular space of an art gallery. Haring’s subway drawings were not his first intervention into public, urban space. In New York City, early in 1980, he began to subtly alter street advertisements, such as one for Chardón Jeans, in which he blocked out letters, so the ad read “hard on Jeans.” He also posted small collages on street lamps made up of images appropriated from print media and bits of painted paper. 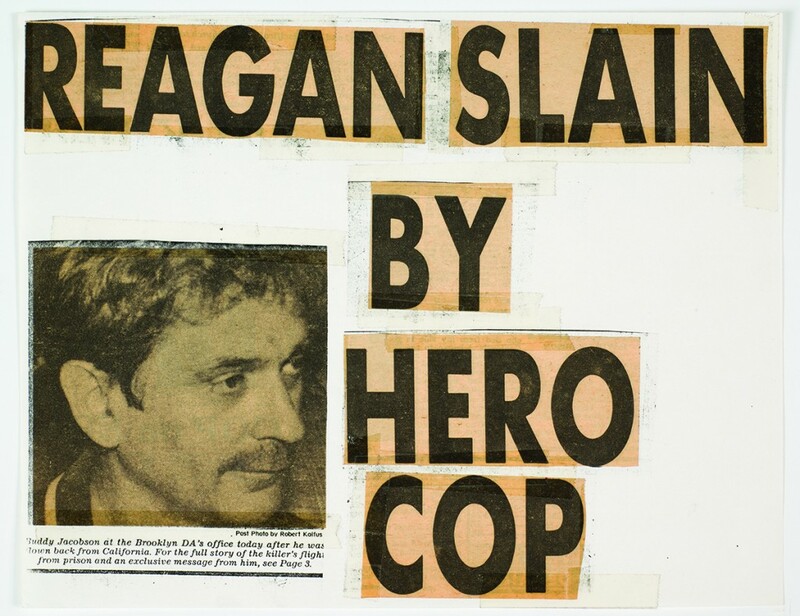 In the summer of 1980, Haring made more overtly political collages by cutting and rearranging headlines from the New York Post, to say things like “REAGAN SLAIN BY HERO COP” and “POPE KILLED FOR FREED HOSTAGE.” He xeroxed these works by the hundreds and posted them all over the city in an effort to undermine the political conservatism of the period. These early experiments helped set the stage for Haring’s subway drawings. In late 1980, Haring noticed that New York City subway’s blank advertising spaces were covered with black matte paper when advertising subscriptions expired. He immediately purchased some chalk, and started drawing. Over the next five years, this became a daily, repetitive obsession: he would ride the subway, look for these empty spaces of black paper, and draw quickly—without any preparation—and then leave on the next train. Through incessant repetition,Haring’s subway drawings allowed him to perfect his highly recognizable reduced linear vocabulary, and to create an inventory of images. Simplification was practical: he needed to complete his drawings as fast as possible to avoid being arrested. He created characters, such as the barking dog and the radiating baby, which he drew on flat planes with no spatial depth, often with only a horizon line or a staircase to suggest space. Drawn close to the surface like cartoons, his images had immediacy and impact, and could carry multiple meanings through various combinations. The radiant baby, for example, could represent birth or purity, but could also be read as a symbol of nuclear energy or bodily corruption depending on what he drew around it. Haring intentionally sanitized the subject matter of his subway drawings, leaving out any explicit sexual and political imagery. He wanted his audience, which included children, to enjoy his works. This made his drawings more ambiguous to an extent, but also more outwardly positive and universal in theme. This work, though, while seemingly straightforward, did incorporate some darker references, including generalized themes of oppression and the abuse of power (image below left), but these were often simplified to such an extent that they remained open to multiple interpretations. Haring’s arrival in New York coincided with graffiti’s peak in 1978-79, when artists covered subway cars, walls, and storefront gates throughout the city. Haring’s well-defined style benefited from graffiti, which offered lessons in how to make graphic images visible in a cluttered urban environment and stressed the importance of motion, speed, and improvisation. Haring never considered himself to be a graffiti artist however. His subway drawings significantly differed from graffiti in location, timing, and medium. Haring often used white chalk and worked during the day so that he could interact with his audience. In contrast, graffiti artists usually used spray paint or markers, working at night. Graffiti encompassed a subculture at the social margins of New York City that excluded artists like Haring both racially and socio-economically. Other artists of Haring’s generation worked within the public spaces of New York City to create and display art including Jean-Michel Basquiat, Kenny Scharf, Barbara Kruger, Jenny Holzer, and Richard Hambleton. In addition the artist collectives Colab, Fashion Moda, Gran Fury, and Group Material used the street as canvas. Like Haring, these artists experimented with alternate distribution systems to expand their reach outside of the commercial art world. Through posters, billboards, or small sculptures, or by engaging the community through artist-run events, pop-up exhibition spaces, or activist demonstrations, these downtown artists (like Haring) regularly put their art and ideas on the street to be enjoyed, and to inform and involve the public. Their intention was inclusion, rather than to alienate or confuse. Haring drew several works of art every day, over many years in the New York City subway, a system used by millions of people. While he made his subway drawings for free, they proved to be a promotional tool that catapulted him into the public spotlight and helped launch his gallery career. In effect, he co-opted spots meant for advertising and campaigned for himself. His drawing was also performative—often attracting an audience captivated by his quick actions and improvisation. He promoted his subway work in other media, including one instance in which a friend taped one of his arrests by the MTA police, which was then featured on CBS News on a nationwide special. He also designed buttons illustrating his characters and gave away thousands to subway riders. Attached to shirts and bags, these buttons enhanced the visibility of his work. In 1982, Haring joined the Tony Shafrazi gallery, but continued to work in the subway. This was a strategy he used throughout his career: operating in both the contemporary art world and in public spaces. His gallery career helped to fund his time making street art for free, and they both reinforced his public presence. Eventually, Haring’s popularity meant that his work in the subways became so valuable that people began to steal panels as soon as he drew them, ending this phase of his work. He continued to create art for all through posters and prints, merchandising, and large scale public murals in cities around the world. Before Haring became a worldwide celebrity, however, he was a local celebrity—generating his first fame through his subway drawings. Michael Auping, Urban Theater: New York Art in the 1980s (New York: Rizzoli, 2014). Peter Belsito, Notes from the Pop Underground (Berkeley, CA: Last Gasp of San Francisco, 1985). Jeffrey Deitch and Carlo McCormick. Keith Haring: 31 Subway Drawings (New York: Art Issue Editions, 2012). John Gruen, Keith Haring: The Authorized Biography (New York: Prentice Hall Press, 1991). Keith Haring and Robert Harris Thompson, Keith Haring Journals (New York: Viking, 1996). Tseng Kwong Chi and Henry Geldzahler, Keith Haring, Art in Transit: Subway Drawings (New York: Harmony Books, 1984). Keith Haring: Journey of the Radiant Baby (Piermont, N.H.: Bunker Hill Pub., 2006). Cedar Lewisohn, Street Art: The Graffiti Revolution (New York: Abrams, 2008). Cite this page as: Dr. Amy Raffel, "Keith Haring, Subway Drawings," in Smarthistory, February 24, 2017, accessed April 21, 2019, https://smarthistory.org/keith-haring-subway-drawings/.